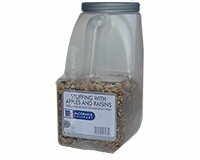 McCormick Apple and Raisin Stuffing pairs well with turkey, chicken and pork entrees. Simple to make with consistent flavor from meal to meal. Ready in just 15 minutes. To make: Pour 8 cups (1/2 gallon) of cold water directly into jar. Replace lid tightly. While holding handle tightly, shake vigorously. Refrigerate immediately. Shake again after 15 minutes. Product is ready to use. Heat if desired. Makes about 29 servings. To make a smaller batches (7 servings) of Apple and Raisin Stuff, shake container to blend ingredients well. Divide into 4 equal amounts; about 8.25oz each. To make, reduce water to 2 cups and prepare as directed above. Ingredients: Bread Crumbs (Enriched Bleached Wheat Flour [Flour, Niacin, Iron, Thiamine, Riboflavin and Folic Acid], Vinegar, Soybean Oil, Sugar, Salt, Leavening [Sodium Bicarbonate], Yeast, Yeast Nutrients [Calcium Sulfate, Ammonium Chloride], Dough Conditioners [Ascorbic Acid, L-Cycstein Monohydrochloride, Azo-Docarbonamide], Spice Extractives), Apples, Raisins, Sugar, Sunflower Oil, Spices, Salt, Dextrose, Onion, Garlic, Orange Peel, Celery, Citric Acid and Spice Extractives Allergy Information: Contains Wheat.